This is what Salem is going crazy over. It was late afternoon, I was in the area, had a couple of minutes for lunch and the line for the drive thru was only three cars deep. Since my last experience denied me the chance to try a burger, I forked over the five bucks or so for the Sonic cheeseburger and tater tots. I decided not to eat in my car and took the sandwich back to work to eat at a table like a civilized human being. 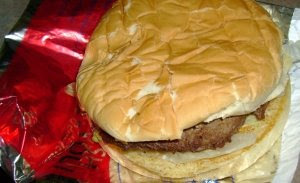 The burger looked like and tasted like a typical fast food chain burger. Dried out patty, soggy shredded lettuce and covered in mayo, which I asked them not to put on my sandwich. The service was quick which led me to believe this cheeseburger was made before I got in line. Actually, I'm not complaining about that. 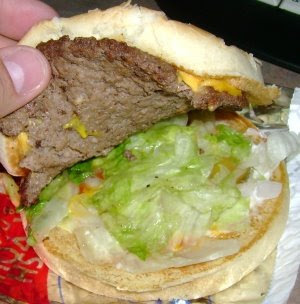 I wish these fast food places would have some hamburgers ready to go right after you order. Remember how the fast food joints used to have the burger stack behind the counter. The cashier would just reach back grab your mac, scoop up some fries and you were on your way. Now they make you wait so you think that they are actually cooking something in the kitchen. If you look carefully, some places will just pull the heated patty out of what looks like a small box tray in the back, drop it on a bun and call it "fresh." If you dared to special order your burger without mayo you were penalized by having to wait off to the side while the next batch gets cooked. In the drive thru, special orders could cause a traffic jam. So, they would have you pull into a parking space and idle until a guy would come out with your lunch. Everyone else in your party got it the worst. Their food would sit in the bag getting cold while your burger was being made. I know this well because my brother would always order a mac without cheese. But back to Sonic, it's over now, I've eaten there, nothing special, I will move on now to more important food reviews. Like a lot of people in this town we fell for the hype. We thought the long lines meant the food must be special. Roller skating servers and drive in ordering, it's so different, it was something we just had to put ourselves through. Never again. Sonic Drive In on Lancaster is no different than any other fast food chain in this town as far as food goes(I'm making this claim not having eaten a hamburger, more on that later.) And, because they have complicated the way that you receive your food, the service is even worse than your average cookie cutter burger franchise. I don't know where to begin, so I'll just give you a chronological account of my Sonic experience. We happened to be on Lancaster this night and we were in the mode of rewarding our children for some hard work that they had done earlier in the day. It looked like some spaces in the carports were open, so we pulled into the parking lot only to be directed off to the side where a line of cars sat in wait for access to the restaurant. I'm not big on lines and at this point, I suggested to my family "how about we head over to Baja Fresh?" With more yes votes than no, I looked to see how I could drive out of the line. There's no escape. On one side you have a row of cars, the other is a strip mall. To make a move, other than inching forward and idling, it would take a twenty point turn. We waited patiently, burning $3.80 a gallon gas until the line opened up and let four or five cars through at once. We drove into a carport but had the choice of several open spaces. Why did they have us wait? Immediately, as I turned to look at the menu a server comes up with a tray of prepackaged dips and condiments and asks if I'd like any with my meal. I said I hadn't ordered yet, but worried I wouldn't see her again, I said "sure." She handed me a handful of ketchups, fry sauces and a few other random containers that I now had to store in my car while we figured out what to eat. We all decided to order hamburgers, press the order button, and waited five minutes for the drive thru guy to respond. Halfway through ordering the guy says, "Oh, I'm sorry, I forgot to mention we are no longer serving hamburgers tonight." Something happened to their grill/fryer forcing us to order corn dogs for the kids and extra long chili cheese dogs for the adults. Into this situation for a half hour now and having an unreasonable amount of ketchup packages piled up in the drink holder, we were very patient. That's when the I heard the first call from the back seat come in, "I have to go to the bathroom." There were some odd things about the bathroom. First of all, no toilet seat covers. Next the soap dispensers are mounted about five and a half feet up the wall, way to high for young kids to reach. And the strangest thing of all, the auto towel dispenser, you know the kind you have to wave your hand in front of to work, it was dispensing towels an inch at a time. The paper towel pictured here was pulled off after two hand waves. My wife made the point that maybe Sonic is environmentally friendly, trying to save some trees. Somehow I don't think that's the case. We're all parked in our SUV's, some idling with air conditioners blaring, a mountain of condiments that I'll never use spilling over in my car and individually wrapped entrees and sides covering their fryer cooked foods. I'm afraid cutting back on my bathroom hygiene is not going to be enough to stop global warming. Back in the car and back to waiting, we got another visit from the condiment gal. I wanted to hand her back some of the ketchup or maybe the honey mustard dressing, instead, I politely said no and continued waiting for the food. It took a long while to get the food, I didn't stop watch it but I would bet anywhere between 20-30 minutes. And of course they got the order wrong. Popcorn chicken instead of tots and no chili dogs. The hot dogs were brought out immediately but the taters took some time. Overall the food was nothing special. The chili cheese dog was about the same as Wienerschnitzel and the tots were on par with Ore Ida. Then, in the middle of our meal, the lights go out. The Sonic sign goes dim and they put up a message saying closed till Tuesday. Apparently something happened with the grill and they are unable to serve the public. What a mess, I'm glad I got this review over with. OMG! What an ordeal! UGH! I have no desire to go there, especially now! While your experience was awful I found the story amusing. Especially the condiment girl and paper towels. I can see your point on this, but honestly, I've been there 3 times, and have never experienced any of the things you've mentioned, other than a 20 minute wait the first 2 times around (but they were both within 1.5 weeks of the grand opening). You also, unfortunately, came on a glitch night (not that you knew, of course). The first 2 times I went to a car-port, I figured out what we all wanted (with 6 kids and 2 adults, it's bound to take some time).. then I pressed the call button and the order-taker answered within 30 seconds. They brought out the drinks within about 2 minutes, and the food came just a few minutes later- fresh, and hot. The staff were courteous and nice. (I do have to admit the bathroom wasn't as tidy as I wanted, but I do believe there were toilet lid covers available & the paper towel machine was working). The third time I went- I went through the drive-through, ordered my food within seconds, got to the window in, like, 2-3 minutes (there were a few cars ahead of me), got my food (hot and fresh) in about 2 minutes, and was on the way. The staff was, again, courteous and nice. I've tried the burgers (man, sooo addicting), the chili dogs (ok, I like Carls Jr chili way better), the fries (on par with McDonalds, and the tater tots (crispy- yum, and yes, like Ore Ida, but there are no such thing as magic tasting wonder tots). I do like the "famous" cherry limeade, but it wasn't what I was expecting. The only thing I didn't care for was the popcorn chicken- it tasted blander than the stuff in Walmarts hot food deli area. I did attempt to go through the drive-through last night, and was promptly told they had no burgers or chicken because the fryer wasn't working. I opted to leave because I was really looking forward to a burger. I am seriously addicted to those things (the Super Sonic burger). I made my husband take me to Red Robin, and the burger didn't do justice flavor-wise compared to the craving I had for Sonic. Every new business has it's kinks- Sonic's only been open a few weeks. I suspect that when they get the all kinks worked out, they'll be as good as anything else out there. For the record, a few weeks ago, KFC on Lancaster had a power-out on their lights at around 8 PM. I thought they were closed, but noticed some employees hanging around outside; they said they were open, but I had to go through the drive-through. They had no signs up saying there was anything wrong, it was pure luck that I noticed the employees and bothered to ask. So see, glitches happen to the "best of them". When we were stuck in that line, I wondered how the businesses in that strip mall were feeling about this? They got our order wrong as well. There food is not good, but the drinks are. So worth going through the drive through on a hot day to get a lemon slush as long as there isn't a wait. I went there Friday night somehow I got stuck in the carport line when I wanted to just go through the drive thru after I got through that little mess ordering was quick got up the window and they had picked up the wrong ticket so they tried to charge me for someone elses meal which was way less and without another combo I had ordered. After that they seem to get on their game about a 5-10 minute wait and we had our food. The extra long coney was pretty good but the only thing they had messed up with we had ordered taters instead of french fries and we got fries. I said we're lucky if that's the only thing we had happen and we took off. Like someone posted above the place is still fairly new and until they weed out the employees and get things straightened out it's going to be hit and miss for a little bit. I dont like sonics burgers! But their drinks and shakes are beyond YUMMY! the tater tots ROCK! Here we go again - another review of a national chain. Maybe your review will instruct folks not to go there. Sonic was smart to open up one of their fast food joints in Salem - a fast food chain in which you can eat in your car. I have eaten at Sonic in the South. The hamburgers are no better or worse than BK or Wendy's. I wish they would stop using styrofoam cups. The use of those is unforgivable. my fiance and i headed to sonic sunday after a long morning out of town -- we were too hungry to go home and take the time to cook. SURPRISE! it said "closed til tuesday", with no explanation why. i'm glad i read your review so i know. i was cranky and hungry and we hadnt been to sonic since it opened, i was really looking forward to it. what a letdown! we went to red robin instead and of course their food is always fantastic. not fast-food priced, but well worth it. we were so hungry by the time we got to red robin, we ate five baskets of fries between the two of us. food coma ensued. Its on the wrong side of town for me to eat at anyway. I wish we'd get something else in West Salem. I had a great experience the one and only time I visited Sonics in Salem. Used to go all the time in the south. I got a chicken sandwich on Texas toast, which was decent and a cherry limeade. which all came out in a timely manner. Well O.K. maybe the experience wasn't great... but it was certainly O.K. and of course I'll go back. Sonic stock and no one I know works there. I just like the Sonic style of fast food. We have not yet tried the new Sonic. It seems too busy every time we drive by. But I will say, we have eaten at Sonics in the south and midwest, and they were good. They aren't there to be gourmet food. They had a decent hamburger, fast service and a way of serving you that was different from all the rest of the fast food places. I never got a bad burger from one. So...Salem, maybe they still need to work out their kinks. Or...it's SALEM! This town has a terrible record when it comes to any type of food. Even chain food. Remeber Tony Romas? Remember CoCos? Remember Lyons? Remember Black Angus? And there are more chains that didn't make it here, but are still booming in other places! DUE TO LOUSY MANAGEMENT!!! Enough said. I've eaten at Sonic in the south and Salem. Still nothing new and the food is just fast food. Nothing exciting. Wendy's is better. The drinks are pretty good especially at happy hour, but other than that, not really a reason for me to wait in line for 1/2 hour. The traffic is a mess too, with too many cars sitting out in the middle of Lancaster and taking over parking from other businesses. I'm surprised they haven't been fined or anything for not managing this better. Overall, people freak out over something new, and the novelty will wear off in 6 months. Give me an In N Out instead. To expect such "high standards" from fast food is uniquely a Salem concept. Everyone knows that it's not about the taste of the food. People want to have their meal brought to them by someone on skates. It's kitchy, but that will wear off soon enough. It goes back to the days of the 50's car hops. The only difference is that I would assume (I'm too young to know) that the food back then was probably better. What is a serious food blog doing devoting so much attention to a national chain burger place? Of course it's going to be bad. Meanwhile, Jr's Taqueria, where you've never been, is now closed for dinner except on the weekends for lack of business. After reading an anonymous post saying: "To expect such "high standards" from fast food is uniquely a Salem concept." I had to go search the web to see if the crowds on Lancaster are also "uniquely . . Salem"
Does not appear to be so (as I suspect is also true of our high standards). I found blogs with postings about new Sonic Drive-In crowds from coast to coast and several places in between. Amecameca, who are you calling a "serious" food blog? Jr's and Mixteca are on the short list, I just have to get over there. More posts about Sonic? Why? Why are there so many complaints about what is written on this blog... seriously if you don't like what is being written then write your own blog. Get over it! Salem man thanks for writing about the restaurants around town. I vote for more Sonic reviews! There a strangely named restaurant called "Burger King" - I think that's what it's called - that I would like to know more about. That's a pretty bold name for a restaurant - Burger KING. Has anyone been there? Any reviews? They have a dish called "The Whacker" that sounds really good. "Here, here!" I second the comment from June 14, 2:48 PM. salem man, when you go to Jr's be sure to try the tacos (carnitas, fish) and chicken sopes. The chile rellenos are decent too. Some of the stuff on the menu may be too authentico for you. Avoid the enchiladas. The mango drink in the big glass jar on the counter is excellente! Jr's is great, authentic Mexcian food. So it La Mixteca (over by Boon's Treasury). Both are undiscovered treasures and never seem too busy (Jr's has been pretty busy on Sunday afternoons). Yet, national chain, food made in a factory Sonic has a line down the street. Eck! Have you ever seen the production process for these national chains? Eck! Eat local! Better, healthier food (not made in a factory with chemical preservatives) and more money stays local and gets respent locally - - a good thing if you live here. The food at Sonic is crap, but the drinks are great! Try the orange or cherry creamslush. Yum! I've tried the sonic twice. All I can say is it's a long wait for average fast food at an above average price. Being a transplant from CA, I've never found a replacement to my In-N-Out Burger. If they would franchise, I'd get one and put it in Oregon. In-N-Out..That's what a hamburgers all about! We ate out 2 times in Salem in the last 5 years, actually Stayton is where APizza is and Dayton is where the Joel Palmer House is so I guess WE NEVER eat out in Salem. I haven't a clue to where we could go to get a good, consistant meal in this town. Where? well i am a car hop at sonic... we arent Condiment girls, we are called car hops! and it is a company policy that we take the curtesy tray out to all the cars! and like someone else said what do you exspect when you go to a resturant's Grand opening!of course it is going to be busy! it seems to me like you are a person that just has to have something to complain about! i mean come on! you complained abut a far up the soap despenser was, is it really that hard to lift ur kid up so they could reach it? and first of all we are not a 5 star resturant we are a fast food resturant so dont exspect 5 star service! when the lot is full of cars and all these orders of course it's goin to get a little hectact and you are going to have a little bit of a wait and yes we do cook ALL foods as soon as they are ordered, that is a nother reason for the wait! that is really one of my biggest pet peves is when someone complains about something so little! if u didnt want to wait and you saw the amount of cars you shouldnt of even pulled in the parking lot! my second pet peve is when some one orders a sonic burger u tel them the price then when they get to the window and you tell them its 4 dollars for a burger they say WHAT $4.00 for a burger??? well just let me say this, the price is on the menu bored if you didnt want to pay $4.00 for a burger u shouldnt of came to sonic. looked at the menu bored, saw the price, and ordered it!! yes we are here to serve you but do us a favor and be a little bit more polite and dont find the littlest reasons to complain about! and another thing YES ocasonially your burger will get messed up! dont u make mistakes? all you have to do is simply tell a car hop your order is wrong and we will gladly re make it for you! and another thing YOU ARE SUPPOSED TO TIP YOUR CARHOPS IF THEY BRING YUR FOOD OUT TO YOU!!!!!!! Wow, speaking of impolite. If your customer service is anything like this rant, then no wonder you don't get tips. uh, wow Carhop Girl. i was not aware that i had to tip you for bringing my food out to me. how the heck else would i get it?! you are getting paid to do your job, where does tipping come into it? if you do an especially awesome job, some people might tip. i probably wont be one of those people. (dont feel special, i wouldnt tip at starbucks either, because all they do is what they get paid to do -- make my coffee and give it to me.) i've been to sonic three times, i think, since it opened, and never tipped. i guess that makes me a jerk, and one of your pet peeve customers, but i sure wasnt aware tipping was required. MAYBE IF YOU YELLED MORE OFTEN like you did in your post, you would get more tips? Take it easy people... The Drive-In fast food is from the 50's, It has major issues, and tipping is a givin... You tip at a diner don't you? all they do is bring your food out! That 37 cents might not be anything to you but it adds up for the under paid car hops! So...there is a new Sonic being built in Keizer on River Rd. I noticed it while apartment hunting because a place we saw advertised was next to Burger King and the new Sonic. Could you imagine? I am a sonic carhop as well that other girl obviously hates her job. haha...well all i want to say to future costumers at sonic is know what your going to order before you press that little red button. When you order a combo, if its a burger they will ask you if you want mayo, must., or ketchup on it and dont say "yes" or "both" because your not answering the question be specific. make sure you tell them if you want fries or tots and what kind of beverage before you start telling them what else you want. If you deliver the perfect order your experience would be much more faster and you wont have to go through the whole recalling the ticket to get the right total and all that junk and the carhops taking your order would appreciate you for that. unless the carhop taking your order is new or a complete idiot. haha. Wow...I have been working at Sonic for about a year and a half. My job is to do everything up front from drinks, to ice cream, bagging food, taking orders and carhopping. I can assure you that customers do not HAVE to tips us for our service. That is your personal choice and as carhops, we appreciate that gesture. I do not know who the carhop that commented earlier was but, she's angry and she is making us carhops look bad. First of all she cannot even spell her words. Just to clarify a few things about Sonic, the cooks start to make the food from the moment that it is being ordered. Everything that we do is on a time limit. The paper towel dispencer has also been working fine. Now, I did not work at Sonic when it first opened but I did get to eat there during the madness, and I personally got good service. I did hear that during the first weeks of the store being open there were alot of mistakes being made because of the hectic environment and the high demands. It also did not help their situation that their main grill broke down. At the end of the day we are all human beings and we all make mistakes, no one is perfect. I know that there are some people out there that are passionate about their food, but why the big debate over a fast food restaurant?
" i was not aware that i had to tip you for bringing my food out to me. how the heck else would i get it?" Use the drive thru then, you tight a**! People are dumb and getting dumber more and more everyday! These folks ran TV commercials that had my mouth watering for several years before they came to Salem. I anxiously rolled into one of their parking spots and ordered through an intercom just like back in the day. Quivering with anticipation as the car hop (Yes, car hop. Can you believe it?) brought me what was, pretty much, a Whopper with cheese! I was crestfallen. I did enjoy the opportunity to dribble ketchup on my upholstery instead of theirs. What fun. The commercials got me too. I bit and stopped in last weekend after a soccer game (hungry!!!). What a disappointment. No different than other fast food joints. I give it a C-/D+ rating. There are many better places to get a burger in Salem. The burgers over at Burger Basket get me to cheat on my diet. I suppose it might have been the high expectations, but I don't have anything good to say about Sonic. They try as hard as they can to get the orders on time and correct. The cooks literally have three and a half minutes or they are yelled at by the managers. It is a degrading place to work. The owners and managers need to treat their employees with respect, especially the cooks and switchboarders. I won't eat anywhere that I don't feel treats their employees well. That's why I stopped eating at the big chinese restaurant by my house - the employees always seemed scared of the lady owner.